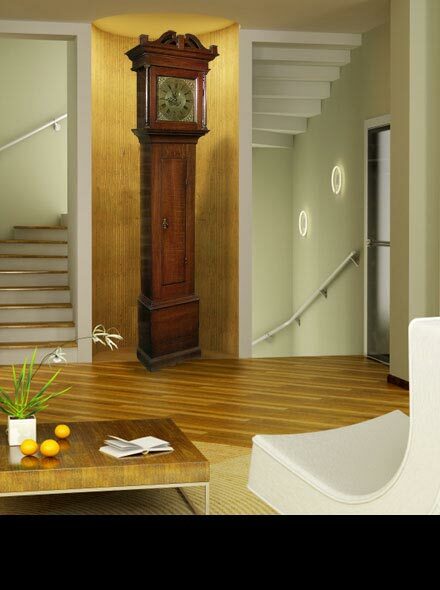 8-day longcase clock with repeater mechanism, square brass dial and cast corner spandrels, c1760. Clocks by Richard Watkin have been recorded with the place-names of Llywel, Merthry Tydfil, Trecastle and Brecon, one having the address "Ceven y Gweision, Llywell, Brecknockshire. Amongst his customers was William Wiliams, Pantcelyn. He normally produced the simpler 30-hour movements, although his probate inventory of 1782 mentioned three clocks in his shop at values of 5 pounds, 2 pounds and 1 pound - the first presumably having an 8-day movement. 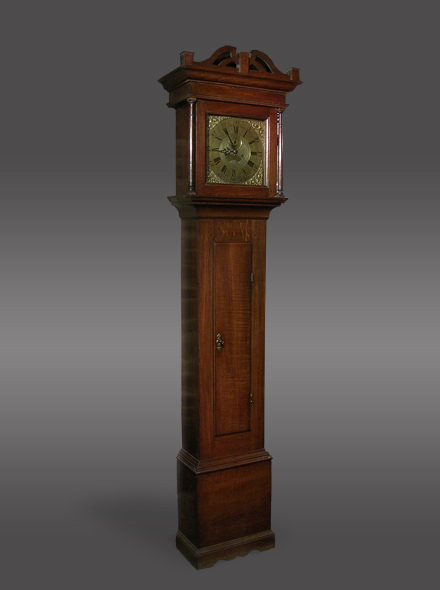 The plain but elegant oak case is typical of those found housing Watkin's clocks and has a square hood with a bold cornice surmounted by a fretwork pediment and finely-turned pillars, over a trunk with a long door above a plain base raised on a shaped plinth.